We had a bridal shower for a friend at work, and here's a little glimpse of my gift. I gave her an Olive Garden gift card (the theme was date night) attached to a cutesified bottle of alfredo sauce. 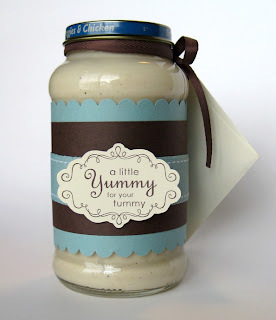 I used the stamp set "Yummy" which is for sale in the Stampin'Up Sale-a-bration catalog.